1. Supports multiple trouble code requests: generic codes, pending codes and manufacturer's specific codes. 2. Reviews the emission readiness status of OBD monitors. 3. Retrieves VIN (Vehicle Identification NO.) on 2002 and newer veicles that support mode 9. 4. Determines the malfunction indicator lamp status. 5. Easy-to-read crystal-clear backlit 2-line LCD display. 6. Safety communicates with the on-board computer, no battery needed. I/M Readiness function is used to check the operation of the Emission System on OBD2 compliant vehicles. It is an excellent function to use prior to having a vehicle inspected for compliance to a state emission program. An I/M Readiness Status result of "NO" does not necessarily indicate that the vehicle being tested will fail the state I/M inspection. For some states, one or more such monitors may be allowed to be "Not Ready" to pass the emissions inspection. "YES"--All monitors supported on the vehicle have completed their diagnostic testing and the MIL light is not on. "NO"--At least one monitor supported on the vehicle has not completed its diagnostic testing, and (or) the"Check Engine"(MIL) light is on. "READY"--Indicates that a particular monitor being checked has completed its diagnostic testing. "NOT RDY"--Indicate that a particular monitor being checked has not completed its diagnostic testing. ▲READ & CLEAR CAR ERROR CODE - Very easy to use, Saving time and Money, Diagnose your vehicle in seconds, read and clear car error codes, saving great money for the diagnosis fee and mechanic labor by locating and fixing the problem yourself at home, or shorten your service time by telling your mechanic what the code was. Supports OBDII protocols: CAN, KWP2000, ISO9141-2, J1850 VPW and J1850 PWM. ▲EASILY DETERMINE PROBLEMS - The I/M readiness status reading helps you to figure out the sensor status and prepare to pass vehicle emission test. Retrieves VIN (Vehicle Identification NO.) on 2002 and newer vehicles that support mode 9. ▲NO ADDITIONAL PURCHASE - Handheld type tool Stand-alone unit with no need for additional smart phone or tablet to operate. No additional cable or app to purchase. 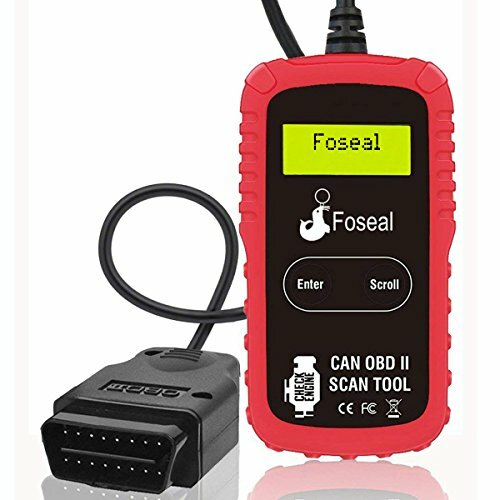 ▲12-MONTH WARRANTY - Great tool for armature applications and quick code responses; Any question with our car code scan tool, please email us for refund or replacement. Your satisfaction is our goal.